I know that there are lots of die-hard beef chili fans out there, but I just don’t happen to be one of them. Somehow, along the way, I managed to train my tastebuds to prefer the flavor of turkey and veggie-based chili, almost exclusively. 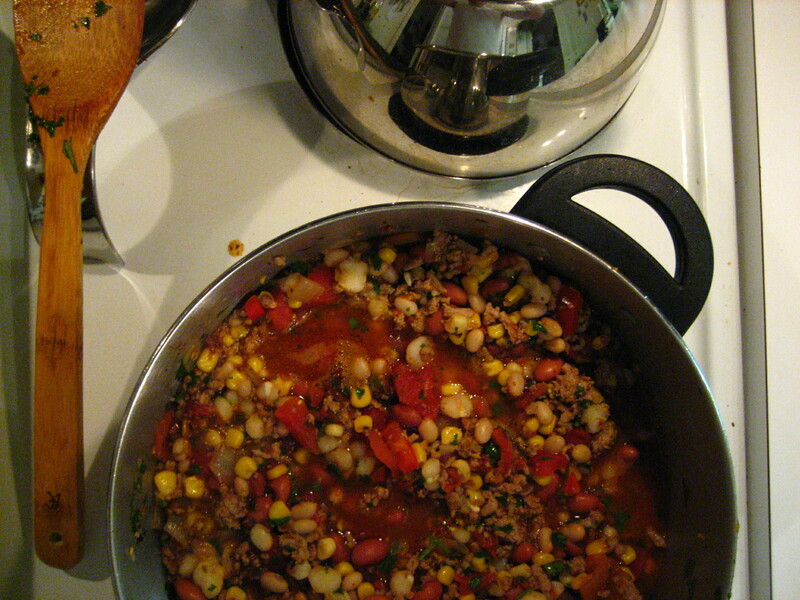 This is likely a throwback from my days of not eating meat, where I had to figure out how to make a few cans of cheap ingredients taste good enough to make me forget about what I either couldn’t afford or wasn’t eating at the time (i.e., beef). As it turns out, a big bowl (or two) of this stuff can make you feel full and feel good about what you are putting into your belly. As the air turns colder and colder, this is one that I’ll be turning to over and over again, not least of all because I almost always have the ingredients in my freezer and pantry. If you live anywhere like Chicago, there are some days when you race from the office to the train/bus and from there to your front door and still feel like the chill has taken over your whole body; the last thing you want to do after work is make a trip to the grocery to pick up something for dinner. On nights like that, I don’t even want to bother ordering take out, since I know my food will be cold by the time I get it! This is another recipe that I encourage you to make your own – feel free to add or omit ingredients, and by all means, use beef instead of turkey, if that is to your taste. With some good crackers, a feel-good movie, and a nice, seasonal brew, this will make you feel like your living room is the snuggliest place on earth. Keep warm!